I love lamb in all its guises. So when I ran across this Lamb & Shrimp Kabobs with Red Harissa recipe in an old copy of Bon Appetit magazine from July 2011, initially I was aghast. Lamb and shrimp? What were they thinking? I was horrified, incredulous, OMG it was so weird. Then I looked at the photo and read the recipe. Well, maybe. What the heck, it’s lamb, I have to give it a try. I’ve never made kabobs from ground meat before, so that was a new fun thing. And I have never made, nor tasted Harissa, so when I made the sauce I was totally bowled over. Actually, the Sriracha was not in the recipe, that was my idea. But it put the sauce over the top. What do you think of the lamb and shrimp combo? I used a 1-tablespoon ice cream scoop to help measure the lamb mixture. It’s pretty sticky, so wetting your hands before forming it works quite well. Originally the skewers were 9 inches long and I cut them into 3-inch lengths. I cooked the kabobs on my grill pan. 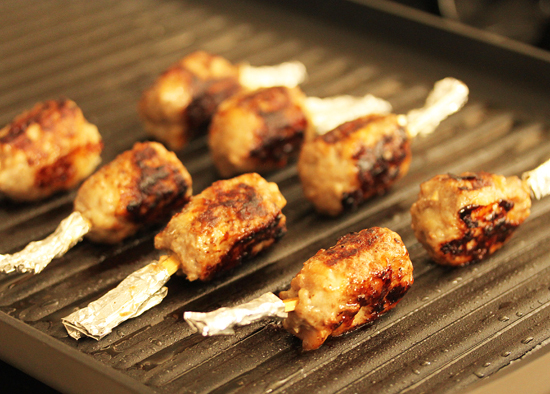 I wrapped the ends of the skewers with aluminum foil so they wouldn’t become covered with oil spatters. Ok, I’m OCD and don’t like to have sticky fingers. Ewww. I did not make all of the lamb mixture into kabobs. 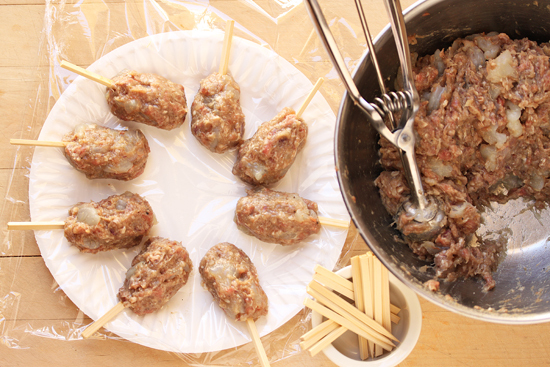 I made 10 kabobs and formed the rest into 6 patties, which I grilled, wrapped in plastic wrap and froze along with little containers of the Harissa sauce. I was thinking of using them in a salad or on a slider with the Harissa. I’ll let you know what I come up with. I’m thinking these will be great to barbeque in the summer for a tasty appetizer. The smoke from the grill will add a wonderful flavor note. Hurry up summer! 1. In a medium bowl, combine garlic, onion, cilantro, cumin, black pepper and salt. 2. Place lamb in a large bowl, add onion mixture and with your hands, blend together well. Add shrimp and mix to combine. 3. Cover a plate with plastic wrap. Wet palms of hands with water and shake off excess. 4. Measure 2 tablespoons lamb mixture and shape between your palms to form a 2-2 ½ ”-long oval. Slide skewer halfway into lamb mixture, pressing to adhere. Repeat with remaining lamb and skewers. 5. Cut 2×2-inch pieces of aluminum foil and cover ends of wood skewers. 6. Brush lamb with oil and cook on BBQ grill, under broiler on rack, or on lightly oiled grill pan until nicely charred and just cooked through, about 3 minutes per each of 4 sides. 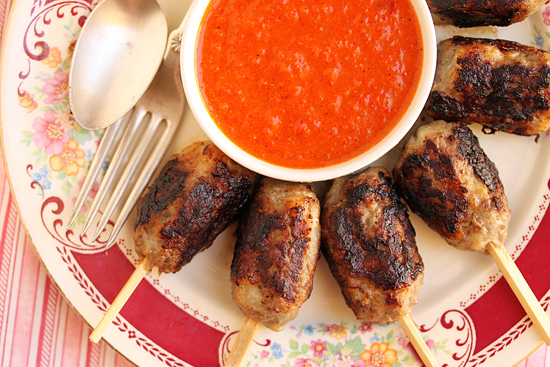 Serve immediately with Red Harissa (recipe below). 1. Roast peppers in broiler or directly over gas flame, turning occasionally, until charred all over. Transfer to large bowl, cover and let stand 15 minutes. 2. Stem, peel and seed peppers. Coarsely chop. 3. Place all ingredients, but olive oil, in large food processor. Puree until very smooth. 4. With machine running, gradually add oil. Season to taste with additional salt and pepper, if desired. Adjust amount of Sriracha, to taste. Shrimp inside lamb? That’s like a Moroccan Turducken! I love your unusual plate and bright colors. Yowza! 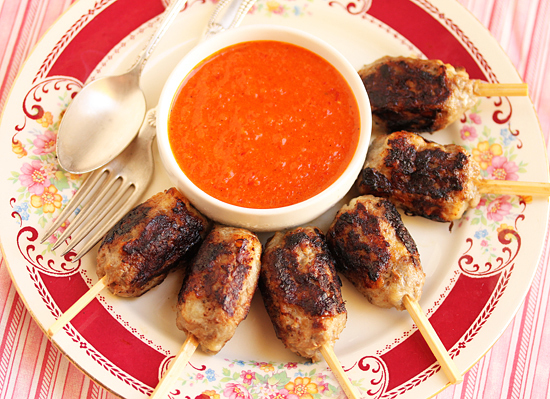 And the mini skewers was a brilliant idea. That looks scrumptious! I love lamb and I love shrimp, but together… that is a new concept to me. I love having my palate expanded. This is such an interesting recipe. I love that combination of ground lamb with shrimp mixed in. Intriguing! And that sauce is gorgeous.